I’m almost finished the big pile of books I received last year at Together for the Gospel. This little volume by J. Mack Stiles is one of them and it’s outstanding in many respects. I appreciate the way in which he ties evangelism tightly to the local church and its ordinary ministry. He wants churches to foster a culture of evangelism. 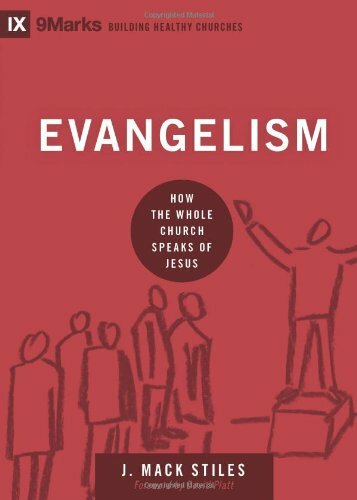 What he means is that evangelism is not something we tack on to the church (like a program), but it needs to be at the core of everything we do and everything we are as believers gathered in a church. Evangelism doesn’t necessarily mean changing what we do, but changing the attitudes with which we do it. The church should encourage believers to be compassionate and intentional with the lost that God has already placed in their lives and praying for him to bring more in their lives. Give yourself grace when you share your faith. I’ve noticed that I often fear evangelism because there are so many ways to go wrong. I can flub the message. I can keep silent when I need to speak. I can say things that later I think were stupid. But it’s good to remind yourself that even your mistakes can help you become a better ambassador. Look for open doors. A culture of evangelism is helpful here. When church members share about the open doors they have seen around them, other members might hear opportunities with which to get involved. Be compassionate and maintain a tender heart toward others. Be careful to remember that you are a sinner. Humility commends the gospel. Remember that we have the answers to life’s biggest questions. That’s something you can offer. When the reality of life pierces through the superficial barriers that keep people from God, that’s where you can shine the light of the gospel. Don’t hide it under a basket. Focus on people’s separation from God, not on being morally upright. Be intentional in your conversation. Plan out what you will say. This helps you to say things that are helpful, and not say things that are awkward or offensive. Acknowledge what we know and what we don’t. Kim’s phrase, ‘a sin-sick world,’ acknowledges the truth we see around us. The Christian does well in that environment because he or she knows how it got that way. I also find it helpful to tell people that I don’t always know the whys of what God does, but that I trust him as the one who makes sense in a broken world. It’s good (though not required) to ask permission to share the message of the gospel. Ask lots of questions. Be a good listener. Revised from a presentation for the Spring Office Bearers Conference held March 22, 2014 in Burlington, ON. In the Canadian Reformed Churches, we hear a lot of talk these days about our need to become more outward looking. It’s therefore certainly worthwhile to consider whether this is simply a passing fad or whether there’s something biblical here that needs our attention. I have three comments by way of introduction. First of all, it may seem like this something that has just popped up recently. However, this subject has been under discussion before in the Canadian Reformed Churches. In 1972, here in Burlington, a minister taught a course about Reformed congregational evangelism. The lectures were later published in a booklet format. Later, in 1979, the material was expanded and published as a book. Perhaps the author was known to some of you: Rev. G. Van Dooren. The second edition of his book was entitled Get Out! & Get Rid of Dilemmas. Some of the questions we’re going to be considering were already addressed by Rev. Van Dooren over thirty years ago. Now the easy thing to do would be to stop here and just tell you to go and read the book. It’s apparently still available from Premier Publishing, so you could do that. However, there comes a time when a younger generation has to pick up the mantle from the older. Even if the questions we’re looking at today are old, they are still being asked and they’re still deserving of an answer from today’s generation. While I respect the work done by Rev. Van Dooren, I’d also like to build on it and take it further in some ways. My second introductory comment relates to my own history with these questions. I was ordained in 2000, as a missionary. I served the Lake Babine Nation in British Columbia, as a missionary of the Smithers church. Together with my family, we lived on a small reserve about 100 km north of Smithers, Fort Babine. A missionary and his task are naturally outward looking. Eventually, the time came when our family was called off the mission field and I became a pastor in a regular church. The Lord called me first to become a co-pastor of the Langley church. One of the ways that the Lord drew me there was through the pleas of his people. They said that, as a former missionary, they needed me to help their congregation become more outward looking. Fresh off the mission field, I had a perspective that could serve their desire to be a church oriented to the community where the Lord placed them. That plea certainly resonated. Indeed, it became an important part of my work there. Fast forward to 2009 and a call came my way from the Providence church in Hamilton. This theme of having an outward looking pastor to lead a congregation that wants to be outward looking came up again. I was recently reviewing some of the letters and e-mails I received from Providence church members when considering the call and I was surprised by how many of them brought it up. It definitely factored into my discerning the Lord’s will for me to move to Hamilton. Based on that, I think you can already sense where this is going to go. My third introductory comment has to do with what one pioneer Canadian Reformed pastor allegedly said. Back a number of years ago, I met an older brother who had been under the ministry of one of our pioneer pastors. The name of the pastor is irrelevant. This older brother told me that Rev. X. had once said something like, “Beware when the church is fixated on evangelism. It’s never a good sign for the health of the church.” I don’t know whether Rev. X. actually said it. I’ve never seen any proof of it and that’s also why I hesitate to mention his name. Regardless of whether it was said, there has often been suspicion attached to those who want to be more outward looking. The sentiment attributed to Rev. X. is definitely out there. When I first heard this comment, I actually tended to agree. After all, there have been those in our churches who have used mission and evangelism as a tool to try and change things via the back door. This is especially true with regard to worship. By having a mission project or evangelism effort with the songs we want sung with the instruments we want played, perhaps we can pull the church along in the direction we think it should go. At times, our missionary-minded and evangelistically-enthusiastic people have not been the most confessionally-grounded people in our churches. The thinking sometimes seems to be that when we do mission work, we have to leave all this Reformed baggage behind. So, that means we have to abandon the singing of psalms, we have to abandon the Three Forms of Unity, and anything else that makes us distinctively Reformed. To borrow the expression of C.S. Lewis, the evangelistic believer or missional church must be “merely Christian.” However, this is a false dilemma. We can be confessionally Reformed in the fullest sense, and be outward looking churches. You don’t have to choose between one and the other. There are Reformed missionaries who have the Three Forms of Unity, not only as their confessional basis, but also as a powerful missionary tool. Around the world in the most surprising places, there are Reformed churches who are not only NOT ashamed to sing the psalms (and even with Genevan melodies), but they delight in doing so. 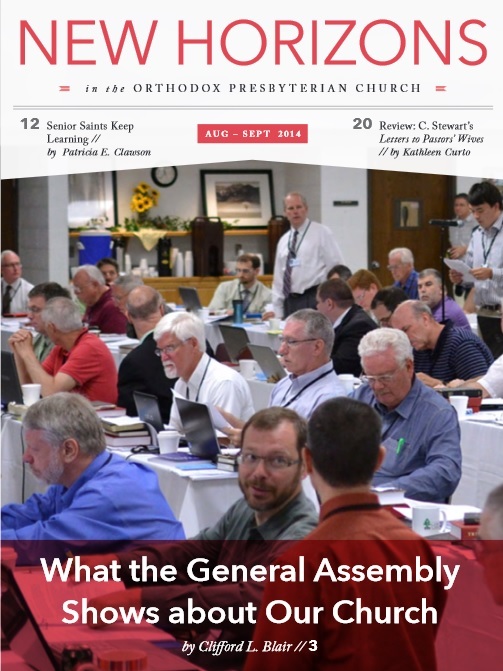 So let me lay my cards on the table at the outset: I am going to argue that not only can confessionally Reformed churches be outward looking and be healthy – they must be outward looking in order to be healthy.